It’s the time of year again when the sweetest of the smoldering remains of summer can be captured and savored. We’ve been obsessing lately about all of the many uses of the Concord grapes that grow wild everywhere in New England. Grape jelly. Wine. Grape pie. You can even create a sour dough starter with the yeasty remains of the last grapes on the vine. Who hasn’t been on a bike ride or a walk in the fall in New England and not been smacked with the earthy, sweet smell of ripe Concord grapes? My 10-year old son Ben picking grapes we found while on a bike ride. It’s a nostalgic smell for me, reminding me of my grandmother’s jars of Concord grape juice lined up in rows in the basement. My mother later said it was difficult to balance the plate on your lap and drink the grape juice and still carry on polite conversation. But she must have pulled it off, as my parents were married when she was barely 19. 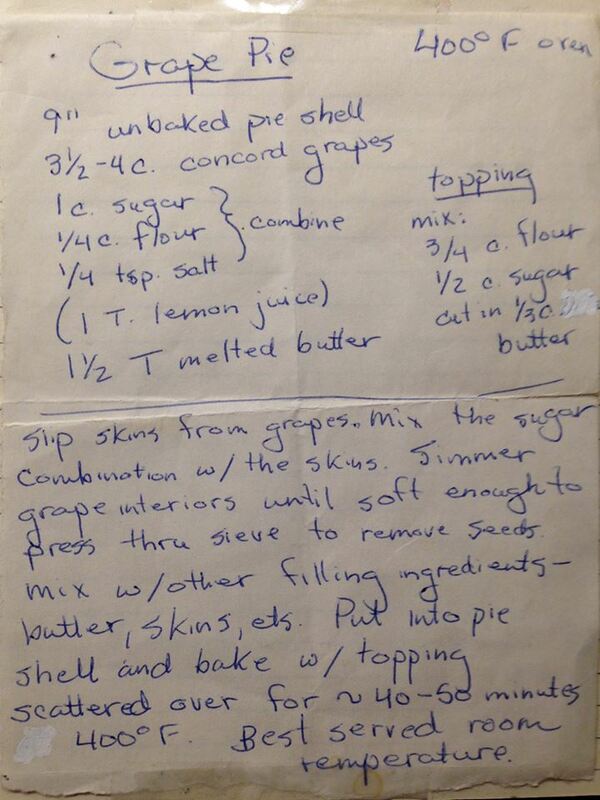 My cousin Ann recently sent me this recipe from her friend Robin Gowen from Santa Barbara, CA for Concord Grape Pie. 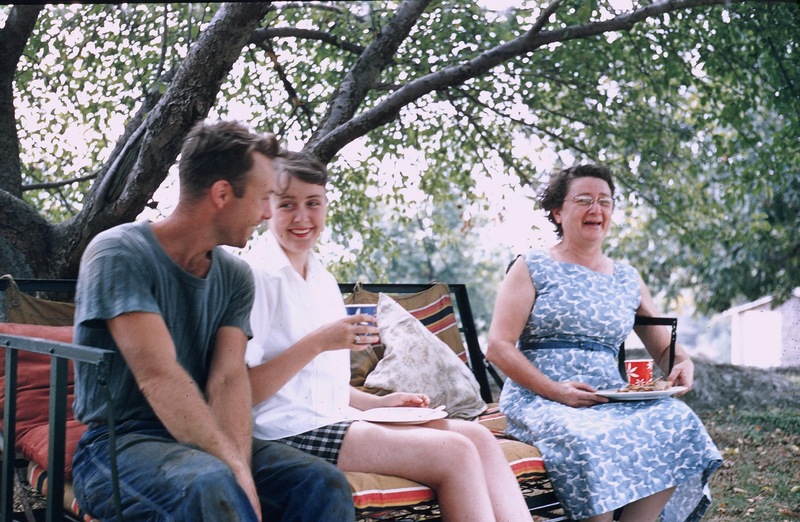 I think Nana would approve of two more generations of Parkers scouring the land for wild fruits to be conjured into treats worthy of the laps of company. Nana Parker heading the table at a family meal with second and third generation farmers Earl and George. She cooked everything from scratch and on a wood stove. 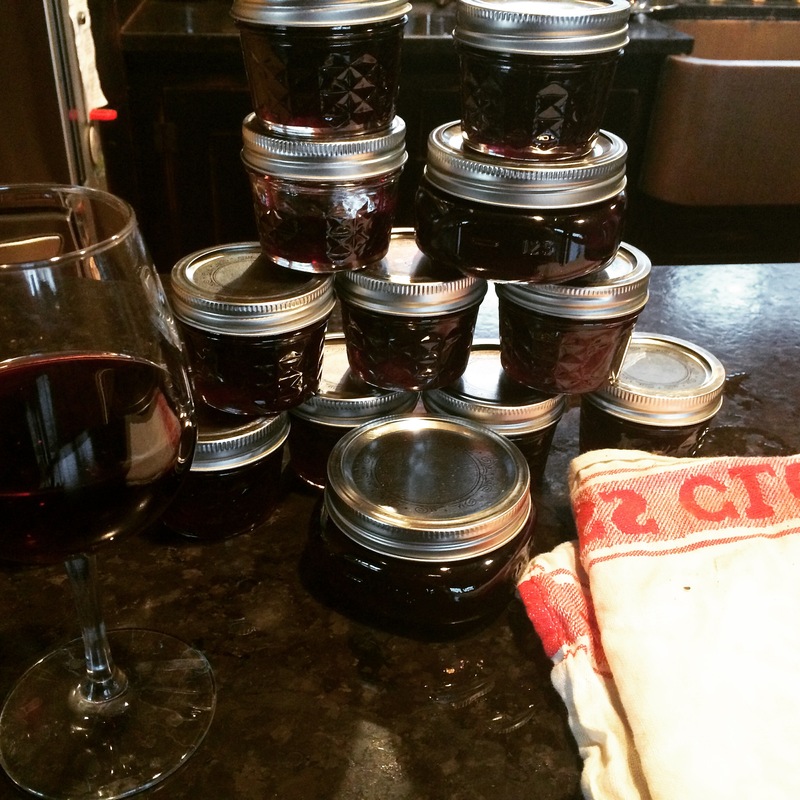 Check back here frequently for seasonal selections from her farmhouse recipe box. 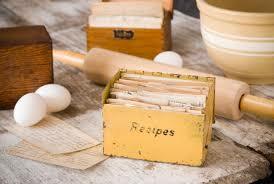 I love rummaging through my Nana Parker’s recipe box. It has so much to teach me about her life, like finding an accidental time capsule. As Thanksgiving approaches, I think of my Nana’s window into this holiday as a direct descendent of Mayflower passenger John Alden, whose well documented crossing of the Atlantic and first winter of watching his compatriots die around him was the screen on which that mythical first Thanksgiving’s harvest celebration was projected. No doubt many things about that crossing and first winter seemed to have cured eleven generations of my family of any type of wanderlust, as my grandmother also grew up in Duxbury, the town right next door to Plymouth that John Alden had founded. We always referred to that old saltbox she and her seven siblings grew up in as simply the “old homestead.” Home for us, I guess, is not just where you hang your hat, but where your ancestors did as well. I am looking for a treat to bake, but I notice something more heartwarming instead. 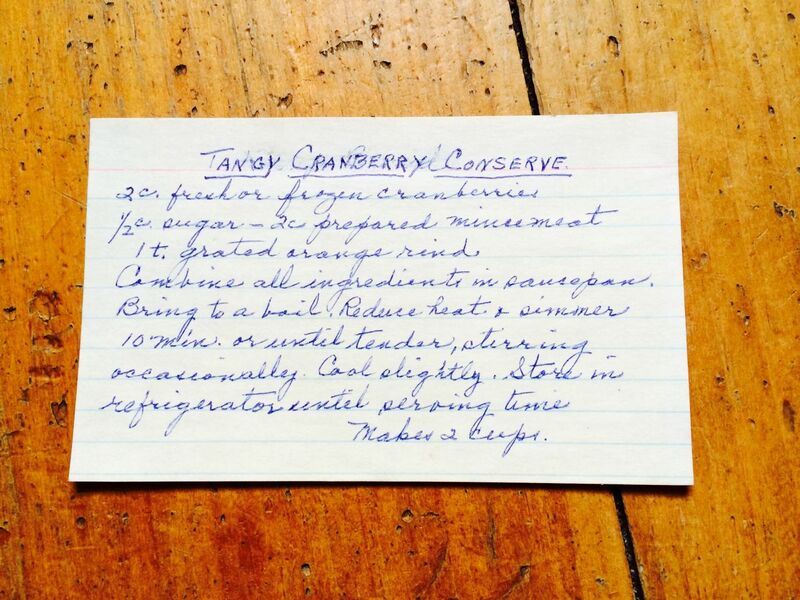 My grandmother had a treasure trove of cranberry recipes in her recipe box—dozens of them—no doubt a vestige of her true seaside provenance near Cape Cod. She was a transplant on this farm, the bride of a poultry farmer who took her away from the cranberries that had provided her family with sustenance and important doses of vitamin C for all of those many generations of long, hard winters. The wild cranberries were a hint, as the Wampanoags knew, that everything we need is already plentiful and provided by the generous sliver of acidic land and the sea. In a twist of irony, several years ago I was hired by the Wampanoag Tribe to develop many of their educational materials, including a children’s book about Cranberry Day. One of my favorite things about the project was the wonderful conversations I had with some of the tribal elders. This is what elder Gladys Widdiss told me about the relationship of today’s Thanksgiving and their Cranberry Day celebration, which I excerpt from the curriculum Heather Miller and I produced for the tribe. These thanksgiving celebrations within the Tribe continue today. In addition to daily thanks there have always been set times for celebration that coincided with changes of season and harvest times. New Year comes at the Spring planting time. Summer is celebrated with Strawberry Thanksgiving, at the time when the first wild berry ripens. Green Bean Harvest and Green Corn Harvest come at mid-summer. 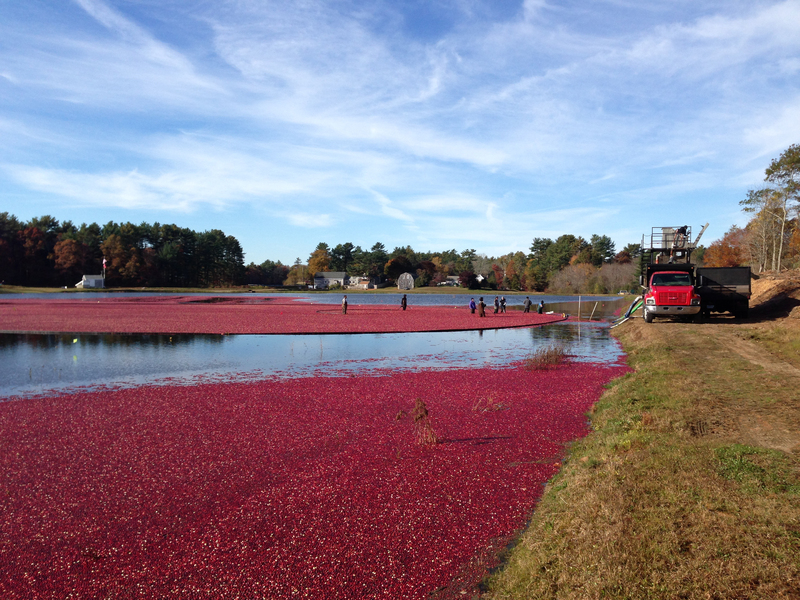 Cranberry Harvest celebrates the ripening of the last wild berry. A ceremony is held around the time of Winter solstice as well. The harvest celebrations are held after the work has been completed. The celebrations held at these different points in the year are times of reflection and a prayer of thanks to the Creator for providing sustenance and have always also included singing, dancing, and the sharing of food throughout the community. This recipe card from my grandmother, I realize, is not unlike a song or dance of thanksgiving for the fire. It’s a gift from my Nana’s table to yours with echoes from a very distant past. Happy Thanksgiving to you and yours from us all at Jo-Erl Farm! Preheat the oven to 400 degrees F. Line a sheet pan with aluminum foil. Place the whole eggplant on the pan, prick with a fork in several places, and rub with olive oil. Roast for 45 to 50 minutes, until the eggplant is very soft when pierced with a knife. Set aside to cool. Halve the eggplant, peel, and discard the skin. Place the eggplant, peppers, and olives in the bowl of a food processor fitted with the steel blade and pulse until coarsely chopped. Pour into a mixing bowl. Meanwhile, heat 1 tablespoon of olive oil in a medium saute pan. Add the onion and red pepper flakes and cook over medium heat for 5 minutes, until the onion is lightly browned. Add the garlic, cook for 1 minute, and add to the eggplant mixture. Add the parsley, pine nuts, lemon juice, capers, tomato paste, vinegar, salt, and pepper and mix. Cover with plastic wrap and refrigerate for a few hours to allow the flavors to develop. Taste for seasonings and serve at room temperature with toasted crusts of bread. Remove dough from the bowl and place on well-floured surface. Fold over once or twice and then cover loosely with plastic wrap for fifteen minutes. Fold dough again; flour the bread lightly. Flower a cotton towel and place over the dough. Let sit for 2 hours. Preheat oven with baking dish in it to 475. (Be sure your dish can tolerate the high temperatures.) Put dough in baking dish. Bake covered for 30 minutes. Uncovered for fifteen. 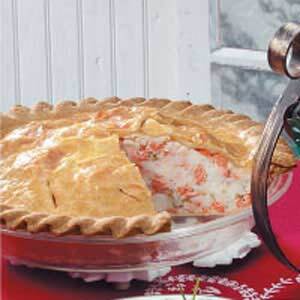 My Nana Todd’s Salmon Pie. 1. Put a couple pats of lemon sage butter on a salmon fillet and bake at 425 for 8-10 minutes. 3. Remove cooled salmon from skin, being careful to de-bone. 4. Fold salmon into mashed potatoes. 5. Add finely chopped onions. 6. Pinch bottom pie crust into pie plate. 8. Pinch top pie crust and add sliced vents. 9. Bake at 325 for 40-45 minutes or until crust is golden brown. 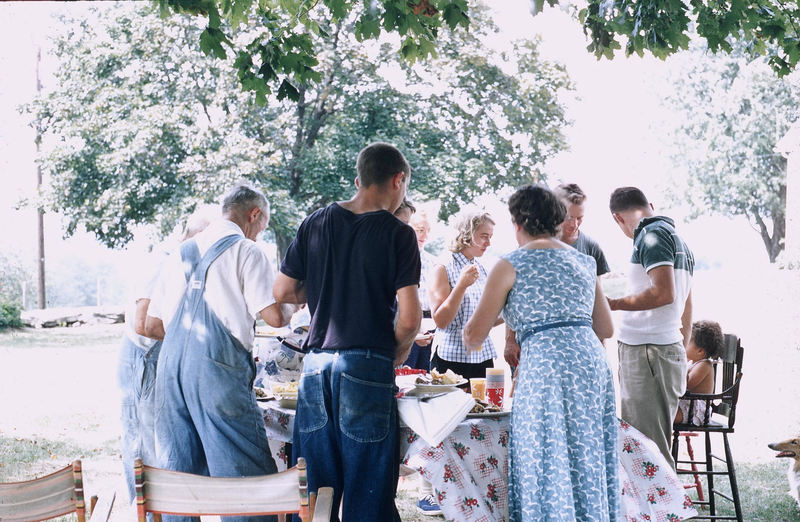 New Englanders have always celebrated the running of the salmon and the ripening of the peas with this Independence Day meal. Our family was no different. We’d grill a whole salmon and maybe also play croquet, depending on the time left between morning milking and afternoon farm chores. While most times, the salmon was simply salted and peppered or stuffed with lemon slices, I’ve added my own twist to the tradition. I add home-made lemon-sage butter before grilling or broiling the salmon from my kitchen garden, preserved in the fall (though you can make it fresh this time of year if you prefer). 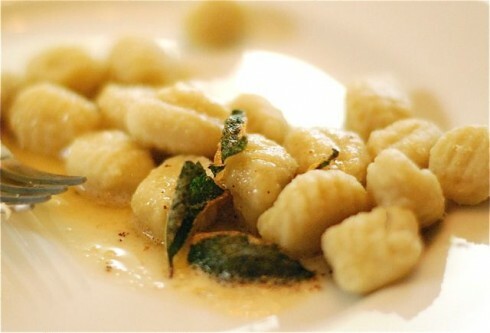 In a small saucepan, cook the butter with the salt over moderately low heat until nutty brown, about 5 minutes. Scrape the butter into a bowl and chill in a bowl of ice water, stirring frequently, just until it begins to harden around the edges, about 5 minutes. Remove the bowl from the ice water and gently beat with a wooden spoon until the butter is slightly pale and creamy. Fold in the chopped lemon, sage and lemon zest. Our farm has always had a great supply of raspberries and blackberries lining the stonewalls that surrounded our hay and corn fields. In my childhood, our entire neighborhood roamed free in the summers, living off of these berries and the contents of our various gardens (with the occasional bologna sandwich thrown in). We got very good at identifying quick and easy ways to prepare these fruits of the land with items we commonly had available—just like my Nana Parker did. 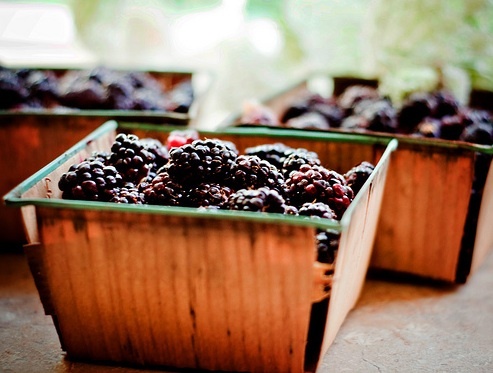 In a large saucepan, combine the blackberries, sugar and cinnamon. Cook and stir until mixture comes to a boil. Combine cornstarch and water until smooth; stir into fruit mixture. Bring to a boil; cook and stir for 2 minutes or until thickened. Pour into a greased 8-in. square baking dish. Dot with butter. For topping, in a small bowl, combine the flour, sugar, baking powder and salt. Cut in butter until mixture resembles coarse crumbs. Stir in milk just until moistened. 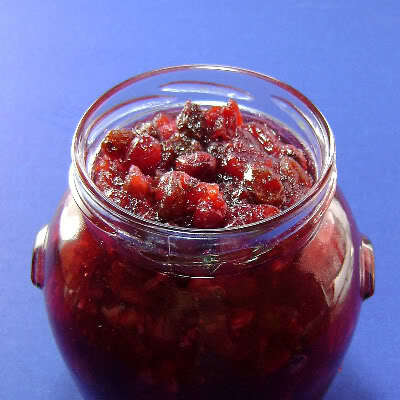 Drop by tablespoonfuls onto hot berry mixture. Bake, uncovered, at 350° for 30-35 minutes or until filling is bubbly and topping is golden brown. Serve warm with whipped topping or ice cream. Yield: 9 servings.